Every so often, people ask me what I give for Kindergarten homework. In this post, I will tell you how I create homework for kindergarten and manage it as quickly and easily as possible. There are also a couple of free downloads, too! 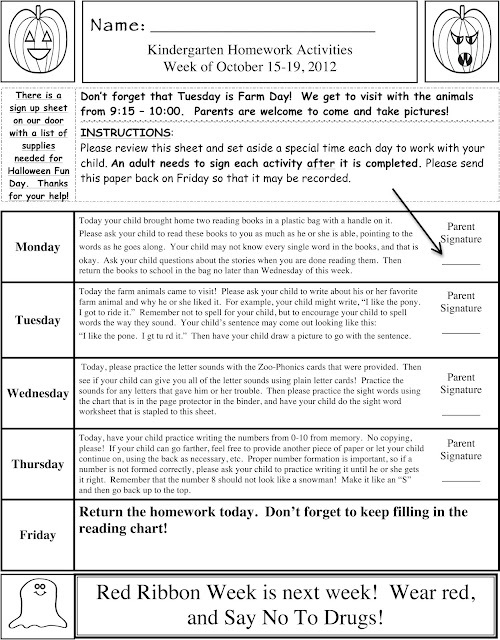 The free download for the cover sheet of the homework is editable, too, so that you can change it each week to reflect what you are working on in your own class. I also love that it doubles as a weekly newsletter for parents, and it forces me to be very concise. If I need to send another note and elaborate on something, I will. But quick, general reminders go on this paper. I do like it, because if parents tell me that they never saw a note, and I know I put it on the homework, my general response is that if the child did the homework and a parent signed off on it, then they should have also seen the paper with the note on it about the change in dismissal times, etc. To get your free download of the homework cover sheet, click here. or Click here for an editable version! This is what the cover sheet for my weekly homework looks like. I change the activities for each day weekly, except that they always take home books to read on Mondays or the beginning of the week, and they always return their homework on Fridays or the last day of the week. First of all, let me establish that my district requires nightly homework at all grade levels, so I really don’t have a choice about whether or not I want to assign it. The children are supposed to have about 15 minutes of homework nightly. The children that are struggling do wind up with more, because they also need to drill on letters and sounds, etc., that in order to catch up to the rest of the class. I regret that this is the case, but it is unavoidable, I’m afraid! They have to catch up somehow. Second, you will notice that there is a lot more literacy homework than math. This is because I find that in Kindergarten, it takes a LOT longer for children to learn to read than to do the required mathematics, since most of the math is manipulative based and not as hard to learn, in my opinion. So, I would rather have parents spending their time on reading activities. When I taught first grade, I gave math homework every night, as well as literacy homework. This is my Read Aloud Chart for October. It has to be at least halfway filled in or I write it down as incomplete and do not give a prize. 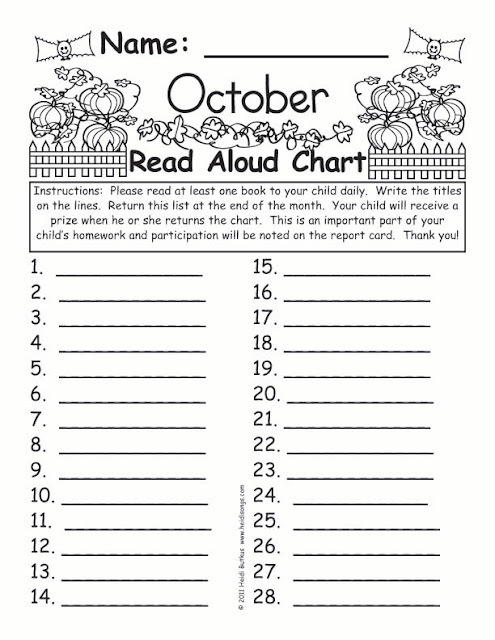 In addition to the nightly homework, children are supposed to read books with their parents as well, and mark them on their Read Aloud Chart for the month. I have a prize box with old toys in it, such as Happy Meal toys, etc. that I get from parents of former students. I let the children that bring back their Read Aloud Charts choose a prize from the prize box, too. Sometimes, parents tell me, “We do read every night, but I just don’t write it down. Can my child have a prize anyway? He really wants one.” I just tell them that I cannot give credit for incomplete work, and I suggest that they hand the child a pencil and have him or her write it down! That almost never seems to happen, unfortunately. Can’t think why. Later in the year, when we really start sounding out words, I add another chart that is similar to the Read Aloud Chart, but says “Sounding Out Words Practice Chart” at the top. The parents are supposed to mark the date when they have practiced sounding out words with their children. I give them Rapid Automatic Naming (RAN) boards to have their children read, and change them out each month. 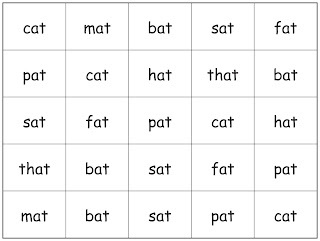 I think this really helps some children learn to sound out words more easily because of the continued practice, and it goes very quickly once they get good at it. Here is a picture of a RAN board. You can download some RAN boards here, including a blank one, at this blog post. This is a sample of a RAN board that I give later in the year as part of their reading homework. I do guided reading with my class, and we check out books for them to take home. Most of these books came from the Scholastic Book club, having acquired them in sets of seven or eight so that I could send them home for this purpose! I send home a note at the beginning of the year, asking parents to take responsibility for any lost books. If a book doesn’t come back, then I call or ask parents at dismissal time immediately for the book. The child cannot get any new ones until the previous one is paid for. I use library book pockets and index cards for my check out system. Each book has a library pocket on the inside with an index card inside it. The card tells the name of the book and the copy number of the book. The book pocket also says what copy it is, too. When the children check out their books, they are asked to write their names on the index card. Then I keep the index cards in a little file box and clip them together by color group. 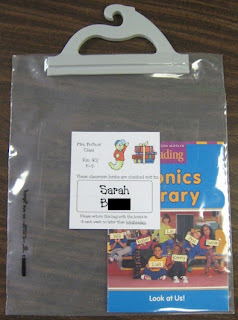 They take their books home in library bags with their names taped on them that I purchase from Demco library supplies. They are very sturdy and usually last four or five years, provided that they do not get lost. (We usually lose about two per year out of 25-28 kids due to damage or loss.) If a child loses one, he or she then gets a zip lock bag for the rest of the year instead of a nice bag with a handle. These are the book bags from Demco that I send home on Mondays for the reading homework. The current bags that they sell now have red handles. I know that checking out books to parents is a LOT of extra time and work, but I do think that it is well worth it, because many of the parents take the responsibility of helping their child learn to read quite seriously. The child gets tons of extra help at home, and then becomes a fluent reader by the end of kindergarten. So it’s one of the best time investments that I could possibly make, in my opinion. My aide does help me manage this as well. This is a page from my CVC book, volume 2. Both books follow the same format. Later in the year, I also assign a CVC worksheet as well for them to do. The worksheets come from my CVC books, either Volume One or Volume Two. There are five worksheets for each word family unit, and flash cards that go with each one. There are large flash cards to use in class, and small ones that fit on a single sheet that I can send home with just one click on my xerox machine. I send home these small flash cards for the kids to cut apart and practice matching up at the beginning of each word family unit. To download a few sample sheets from one of our CVC books, click here. 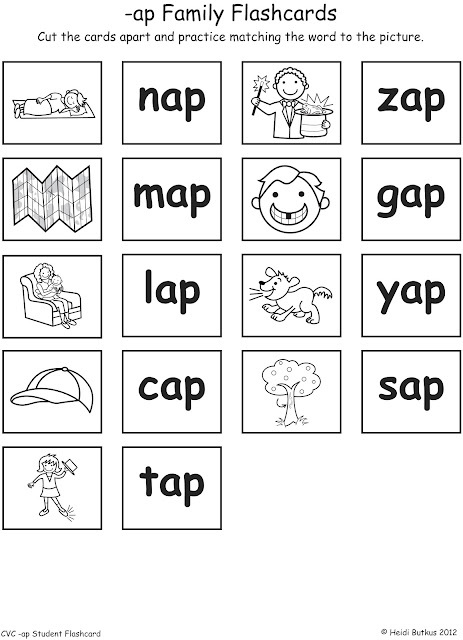 This is an example of the Student Flash Cards that I send home at the beginning of each CVC word family unit. On Tuesdays, I usually assign a sentence or two for the children to write. Ideally, it should be very close to what we are going to write about in class on Wednesday during guided writing, because this will make my job just that much easier the next day. So when I make my homework, I think about my lesson plans, or visa versa. I ask the parents to help their child write a sentence, such as I did in the Tuesday box above. Then I give them the blank sentence writing sheet here. On Wednesdays, I usually assign a sight word worksheet. 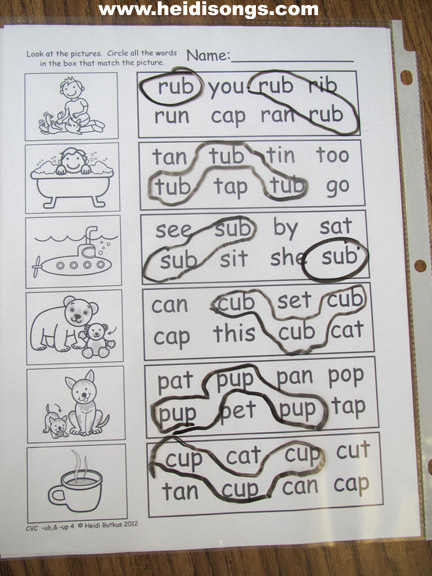 I usually pick one from one of my Sight Word Workbooks. 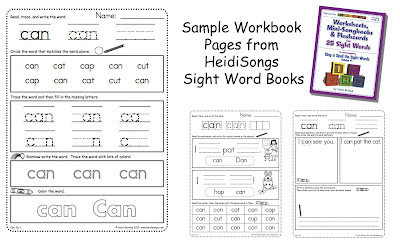 There are three different types of worksheets for each word, plus a Mini-Sing Along Songbook for each one. I just choose one of these worksheets to include into my homework. You can download some sample pages from one of these books here. These are some sample pages from the HeidiSongs Workbooks. On Thursdays, I assign math homework. I plan my math homework based on what the children seem to need to practice the most. This week, my students needed to work on number formation and writing the numbers from memory, so I gave them a worksheet that would give them an opportunity to practice that. You can download it here. As you can see, each night also has a few instructions for the parents on how to help their child do the assignment. I do realize that there are probably some parents that do not really read it carefully, and just sign off on the activity any way. But I know that there are many that do! So I think that it is worth the trouble. These are some sample pages from the Counting Creatures Addition and Subtraction Books, and the Counting Creatures Volume One and Counting Creatures Volume Two Books. A few weeks ago, I sent home some xeroxed shapes in different sizes and colors and asked parents to help their children practice sorting. Before that, I gave them instructions to find household objects and have their child make patterns, and then included a patterning worksheet. I also use a LOT of the Counting Creatures worksheets. There is a book of worksheets for the numbers zero through ten, and another workbook for the numbers 11-20. I have also included some of the Matching Sets Worksheets, the Counting Creatures Addition and Counting Creatures Subtraction Worksheets, depending on our units of study. One thing I have to say is this: since we usually just use the worksheets as a learning center by putting a bunch of them in dry erase pockets, I don’t have to worry about the children doing one of them again with a pencil at home. The children have never complained about that! So far, given that I have access to all of these workbook sets, I have never run out of anything to give the children for homework! And if I lack something, I just make up an activity and tell the parents to practice it home, such as I just described with the shape sorting above. You can download some samples of the Counting Creatures Books here. On Fridays, the children just need to turn in their homework, so the instructions are very minimal. I ask the families to keep the entire packet stapled together if they possibly can, and that helps me keep track of it. One thing that I have encountered is that often children will do the homework, but forget to turn it in, even though the entire class is turning in their homework sheets in a great commotion! To encourage the children to get their homework out of their binders and put it in the homework box, I sometimes get out my Staples “Easy” button and let them push it after they put their homework in the box. That REALLY works! Follow me! Did you enjoy this post? Do us a favor and share it with your friends! And follow this blog by signing up email updates, or follow on Bloglovin’. You can also follow me on TPT! I’m also on Pinterest, Facebook, Twitter, Google+ and YouTube, too! Don’t forget to sign up for our email newsletter (on the left sidebar) for special deals and promo codes that you won’t find out about anywhere else.